A sad day once again in the world of rock, as another name from the classic rock generation passes on. Orleans singer / songwriter, Larry Hoppen sadly passed away on the evening of Tuesday 24th July, 2012, he was 61 years old. Still performing in recent years, I caught Larry playing Orleans hits, performing with the 'Voices of Classic Rock' tour, back in 2001, in a lineup that included such names as Joe Lynn Turner (Rainbow, Deep Purple, Yngwie Malmsteen), Glenn Hughes (Deep Purple, Trapeze, Black Country Communion), Mike Reno (Loverboy), Pat Travers, Spencer Davis, Bobby Kimball (Toto) and John Cafferty. Formed in 1972, Orleans released twelve studio albums between 1973 - 2008, although they went on hiatus in 1997, reforming in 2001. Indeed, 2012 was the 40th year of the bands history. RIP Larry, thoughts and prayers go out to your family. It is with a heavy heart that I share with you the news of my brother Larry's sudden passing on the afternoon of July 24th, 2012. By now, many of you have already become aware of this fact but, to be sure you are all aware, I am writing to you now. The official press release is copied below and that's all we have to say about his passing, officially. On a more personal note, Larry was both my older brother and my partner of the past 40 years in this journey called Orleans. Words cannot express the depths of my sorrow. I know that holds true for Lane, Fly, Charlie, John Hall and all the rest of us who worked with him so closely over time. Thanks to alll of you who have already been so kind with your well-wishing calls, texts, voice mails and emails. Unfortunately, I cannot answer each one individually, but know that your kindnesses are appreciated. Please, unless we are already close, I would ask you not to call my personal telephone number at this time. Obviously, we will not be able to fulfill our commitments for this weekend's shows. We are all in shock here. On the other hand, with the promoters' permissions, I intend to do the rest of the shows on the books for the remainder of the year. Certainly, Larry is not replaceable but, with the aid of the many fine artists we have worked with, I feel we can somehow satisfy these commitments, with class, in his honor. It is my intention to finish our work, not just default and disappear. As indicated below, Larry's paasion was in aiding food banks do their work in local communities. A contribution there would honor his memory. The suddenness of this event has left me personally in charge of satifying much unfinished business. Some of it is simply unsalvagable and creates significant hardship. If you feel moved to do so, you may make a contribution of any amount to our PayPal account at orleansonline@gmail.com , which I will use best as I can to honor our economic commitments to others. Humbly, I thank you in advance. At this time, there are no plans yet for funeral or memorial services. Those arrangements are in the hands of his wife, Patti. As that information becomes available, I will pass it on within the context of her wishes. Please keep our family in your hearts and prayers. Larry got a call from (former US Congressman, D-NY, 19) John Hall, inviting him to come to Woodstock, NY to join with the late Wells Kelly and John to form Orleans which he did in early 1972. 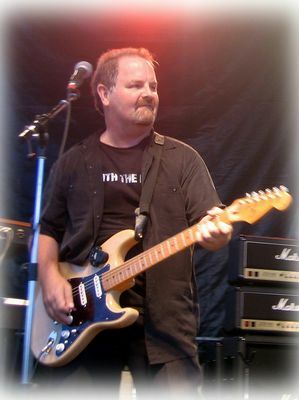 Larry's younger brother, Lance, joined the band the following fall. Tens of millions know Larry's uplifting tenor from the Orleans hits "Still the One", "Dance With Me" and "Love Takes Time". the late great Artie Traum, John Sebastian, Bela Fleck, Felix Cavaliere, Edgar Winter, Robbie Dupree, Spencer Davis, Rick Derringer, Mark Farner, John Ford Coley, Jimi Jamison, John Cafferty and many more notable artists. The Family asks that since Larry's passion was feeding hungry people, his friends and fans can honor his memory by making a contribution to their local food bank in his name. of his former colleague Larry Hoppen of Orleans. I'm sure they'll be many more tributes to the man.